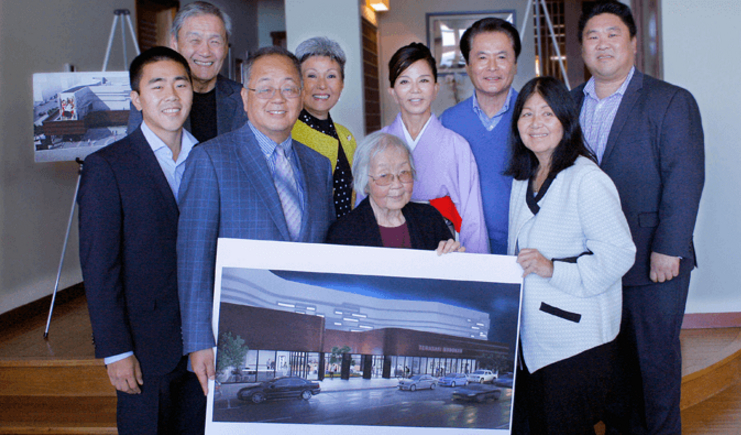 Terasaki Family Foundation donates $3.5 million for Little Tokyo gymnasium. A game-changer. That is the impact of a $3.5 million donation by the Terasaki Family Foundation for construction of the Budokan of Los Angeles. The multi-purpose gymnasium will be named the Paul I. Terasaki Budokan in honor of the late Dr. Paul Terasaki, a longtime supporter of the Japanese American community and a pioneer in organ tissue typing. In basketball terms, the Terasaki Family Foundation donation is Steph Curry squaring up for a three-pointer late in the fourth. For Little Tokyo, it means the long-sought dream of a gymnasium in the community is that much closer to fruition. “We’re completely overjoyed and appreciative of their generous gift: $3.5 million is a major boost to our capital campaign,” said Dean Matsubayashi, Little Tokyo Service Center executive director, said in an interview with The Rafu Shimpo. Terasaki, son of Paul and Hisako Terasaki, will be joining the LTSC Board of Directors. He is an interventional radiologist at the Kaiser Hospital on Sunset Boulevard in Hollywood. LTSC has raised over $23 million and is 90 percent complete with the capital construction campaign. A ceremonial groundbreaking ceremony at the site on Los Angeles Street is planned for August. Once the construction capital campaign is complete, LTSC will seek an additional $3 million for an operating endowment fund. Budokan, in its early stages, received substantial support from the Aratani Foundation, which was instrumental in jump-starting fundraising. The gymnasium will be named after them. The George, Ruri, Lisa and Nathan Sugimoto Family Foundation also made a generous donation and the lobby will be named on their behalf. Both family foundations have been generous supporters of many Japanese American community organizations. Mike Murase, LTSC director of programs, said the campaign has been multi-faceted, from corporate sponsorships to grassroots outreach to many groups, including the basketball teams and leagues throughout Southern California. LTSC first began working on the concept of a Little Tokyo gymnasium in 1994. Matsubayashi, who joined LTSC in 1996, said the mission for the Budokan has evolved as Downtown and the Japanese American community have changed. “At that time the big motivation for the gymnasium was more of an economic development tool because there wasn’t a lot of activity going on in Little Tokyo. The question was how can we bring young people and families back to Little Tokyo?” he noted. When the Budokan is finally built, it will have been a long time coming. The kids who first put their handprints on murals in support of the gym in those early years are adults now. Nakatomi pointed to a framed photo of a drawing of the gymnasium given to her by then-LTSC Executive Director Bill Watanabe, who led the early efforts to build the Budokan.